This is the right moment to better understand the changing dynamics of consumer debt, how households are managing the debt they are carrying, and the conditions under which it is a source of financial insecurity. The Aspen Institute’s Expanding Prosperity Impact Collaborative (EPIC)—an interdisciplinary approach to illuminating and addressing critical aspects of household financial insecurity—is focusing on consumer debt. EPIC is studying this issue now because consumer debt has reached record highs amid an economy more robust than at any point since the end of the Great Recession. Unemployment is at historic lows and wages are up, leading to many rosy interpretations of current debt trends. Yet signs continue to point to the fragility of many families’ finances, and households’ experiences with debt in the current economy vary widely on demographic and geographic lines. This is a critical moment to better understand the changing dynamics of consumer debt, how households are managing the debt they are carrying, and the conditions under which it is a source of financial insecurity versus an opportunity for future mobility. EPIC’s particular focus is on non-mortgage consumer debt, such as loans to pay for college or to purchase a vehicle, money borrowed on credit cards, and non-loan debt (i.e. municipal fines and fees, medical debt, and unpaid bills). Non-mortgage debt has not received the extensive attention given to housing borrowing, largely because the size of the mortgage market. 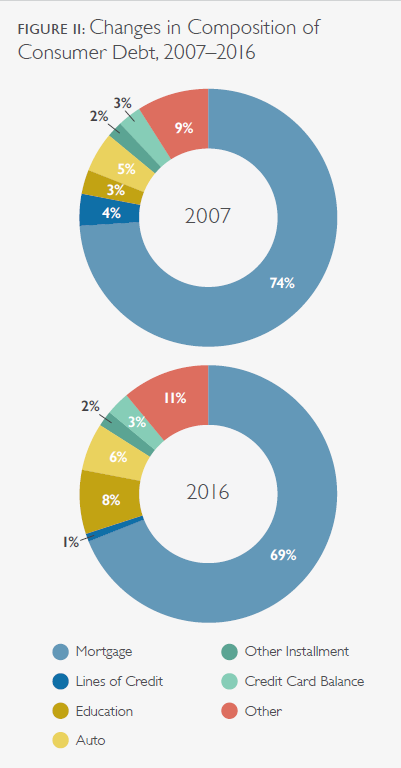 However, housing debt is declining as a share of household debt and current causes for concern—such as rising rate of serious delinquency in credit cards and the emergence of subprime auto loans—relate to other areas of the market. This primer distills the research on consumer debt, from its drivers and its dimensions to its impacts on households and society as a whole. EPIC will use this critical knowledge base to articulate a framework for developing solutions to improve the financial lives of millions of Americans. Traditional economic theory posits that households behave rationally in borrowing and managing their debt based on their understanding of their future income. People tend to borrow heavily in young adulthood (when they have lower incomes but high costs such as education and housing), continue to borrow but at a slower pace during middle age, and then slowly pay down debt through old age. 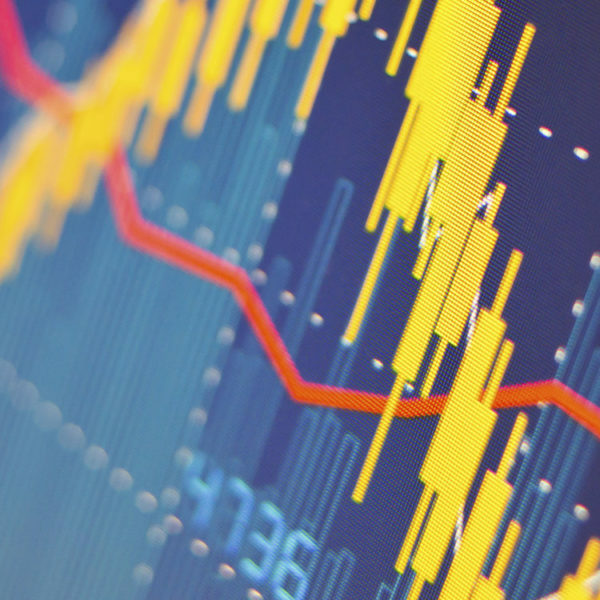 Research confirms that age and life stage do determine borrowing patterns, but the strength of this relationship may now be changing along with household demographics and income dynamics. Moreover, access to credit doesn’t depend on age and credit history alone; it is also affected by macroeconomic conditions and demographic characteristics, especially race and ethnicity. Borrowing and accumulation of debt are also influenced by sociological factors including consumerism. Consumption is a key element of social identity, and people often support status-enhancing consumption through borrowing. The long-term trend of rising household debt began in the 1950s. Although the emergence of credit cards and other unsecured credit contributed, mortgages were the driving force. This reached a tipping point during the Great Recession, leading to a dramatic, nearly decade-long pullback in mortgage borrowing. 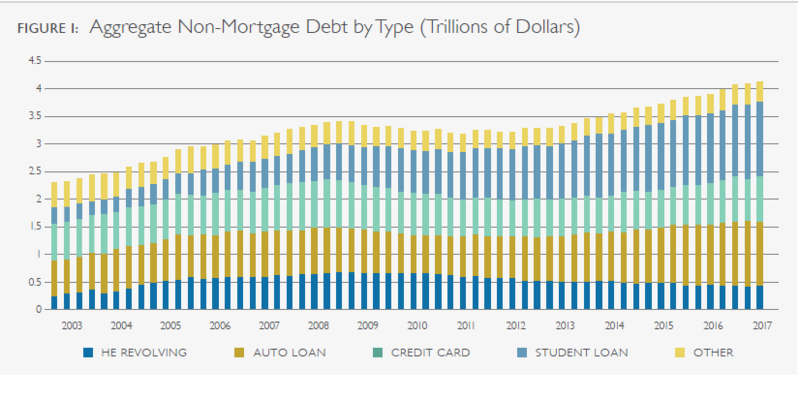 Overall consumer debt, however, surpassed the levels that preceded the Great Recession due to growth in student and auto loans. As a result, the composition of aggregate and household-level debt has shifted and become less consistently effective at supporting wealth-building. Consumer debt is not spread equally. It varies by geography, age, income, and race. Most types of debt—though not credit card debt show geographic variation. The composition and amount of debt varies by age but these patterns are changing. For example, although being of traditional retired age is associated with lower debt levels, the share of retirees carrying debt is above the historical average. 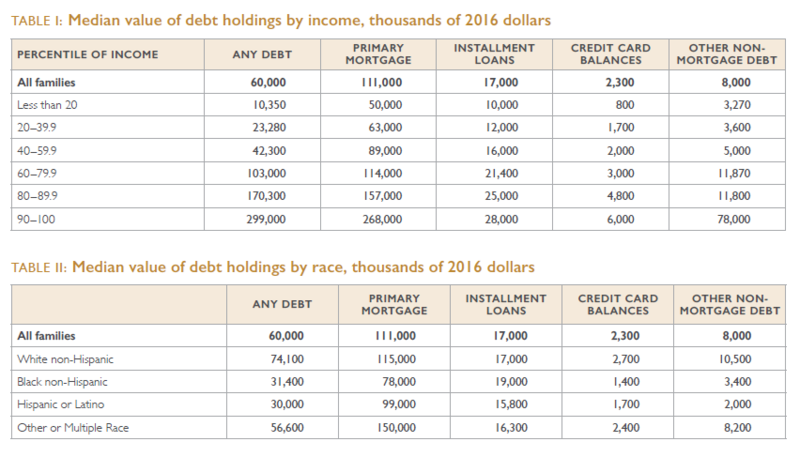 With regard to income, debt burden is highest for middle-income households; the poorest households have the lowest levels of debt, but their debt is disproportionately from credit cards, high-cost unsecured loans, and unpaid bills. 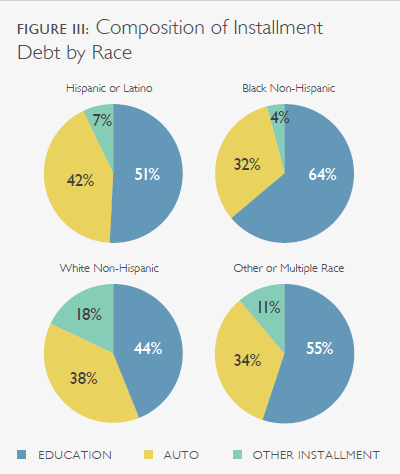 There are stark differences in the amount, characteristics, and composition of debt by race and ethnicity that lead to or reinforce adverse outcomes for people of color. Today’s differences are rooted in historical exclusion and structural barriers, but ongoing predatory and discriminatory lending practices also play a role. Out-of-pocket medical costs, which can generate medical debt, can be a source of financial insecurity even at relatively low levels and for consumers with healthy credit histories and otherwise manageable debt burdens. Medical expense shocks are fairly common, and the protection of health insurance is often insufficient with 20% of consumers having a medical collections tradeline on their credit report. State and local government fines and fees, which governments have increasingly relied on to finance public services, a trend that has disproportionately impacted communities of color. These debts can have cascading negative effects on family finances, as they lead to driver’s license suspensions, garnishment orders, and even jail sentences. A burgeoning source of harmful non-loan debt is fees resulting from lawsuits filed against consumers by debt buyers, which are clogging state courts. Unpaid bills, which account for over one-third of all delinquent debt. In addition to medical debt, unpaid phone and utility bills in collections most frequently appear on credit reports. Getting behind on payments for these basic services often reflects underlying financial insecurity; having these overdue bills reported to credit bureaus and in collections strongly reinforces that insecurity. Consumer debt is often a positive force in people’s lives and supports economic growth, but its negative impacts on households are serious, widespread, and inequitable. Consumer debt is most likely to cause financial distress when a household has a high debt burden, as measured both by the proportion of income used to service debt and their subjective perception of financial stress. Carrying too much debt can create a rapid downward spiral that starts with higher debt servicing costs and can lead to court judgments and garnishments of wages, tax refunds, and other payments. The ultimate negative consequence, bankruptcy, fails to deliver long-term relief to many filers. Debt can also curtail households’ ability to save and build wealth. The pathways through which credit and debt lead to mobility have become less reliable and are broken for some borrowers. For example, today’s unprecedented level of student loan debt has raised questions about the degree to which the benefits outweigh the costs, especially given their role in reducing homeownership and entrenching racial wealth inequality. There are also negative household impacts not reflected on balance sheets, including physical and mental health challenges. It can affect personal relationships including romantic partnerships and family formation. Those whose debt is a source of financial distress are most likely to experience corollary ill effects. There has been less attention to the macroeconomic impacts of non-mortgage consumer debt outside of the connection between debt and debt-driven business cycles. The general consensus is that no other type of consumer debt shares the systemic significance of mortgages, but that rising credit card and auto default rates are cause for concern as they signal households’ financial strength. Increasingly, economists raise the possibility that the negative relationship between student debt and homeownership could be a drag on economic growth. The inter-relationships of consumer debt and macroeconomic conditions deserve greater attention in the future. Although extensive research has already been completed on consumer debt—including its character, causes, and consequences— much remains to be explored. Some of the gaps are already identified in the literature. For example, there remains a poor understanding of “tipping points” at which a household’s debt becomes more harmful than helpful (Emmons & Ricketts, 2017). Research into each of these questions should consider variations based on households’ demographic characteristics, including race and ethnicity, gender, and age. Deeper examinations of the role of race are particularly important, given the existing evidence of disparities that disadvantage people of color. Many of the most acute debt-related challenges cannot be resolved without considering and responding directly to racial inequities. to understand the role and characterize the impact of consumer debt in household finances is that the “goodness” or “badness” of any individual borrowing decision depends not only on the household’s cash flow, other obligations, and assets, but also on interactions among the different debts that people carry and a multitude of other factors. Households’ financial and family contexts change over time, sometimes suddenly, exacerbating consumers’ struggle to accurately assess whether a particular debt will be affordable or help them reach their goals. And yet, while each family has its own context, debt is a shared experience that impacts virtually all households at some point in their lives. The problems identified in this primer require solutions that are broad enough to meet the needs of millions of households, yet flexible enough that they increase families’ ability to adapt available resources to fit the context of the rest of their lives.